Be prepared for some science. Here is what the weather service expects, along with our interpretation of Sunday night's severe weather threat. 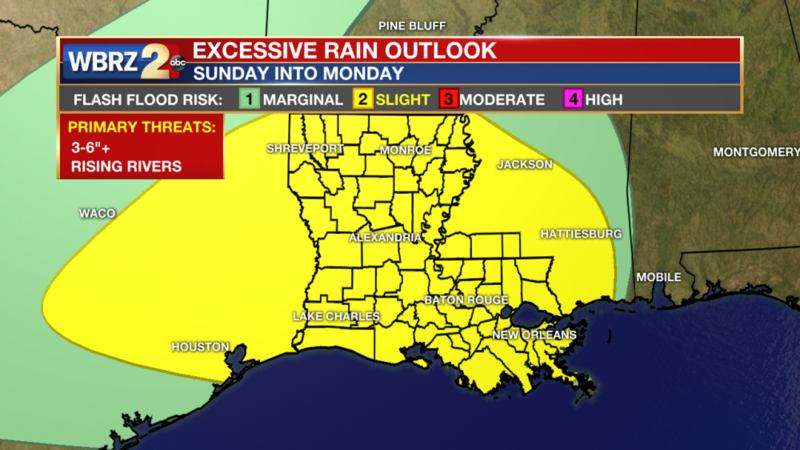 A strong storm system will bring the risk of flooding and tornadoes to the central Gulf Coast Sunday into Monday. Once again, those in the forecast area should be reviewing preparedness and safety plans for flooding and severe weather. An area of showers and thunderstorms will develop late Sunday and rain could fall heavily at times overnight into Monday morning. 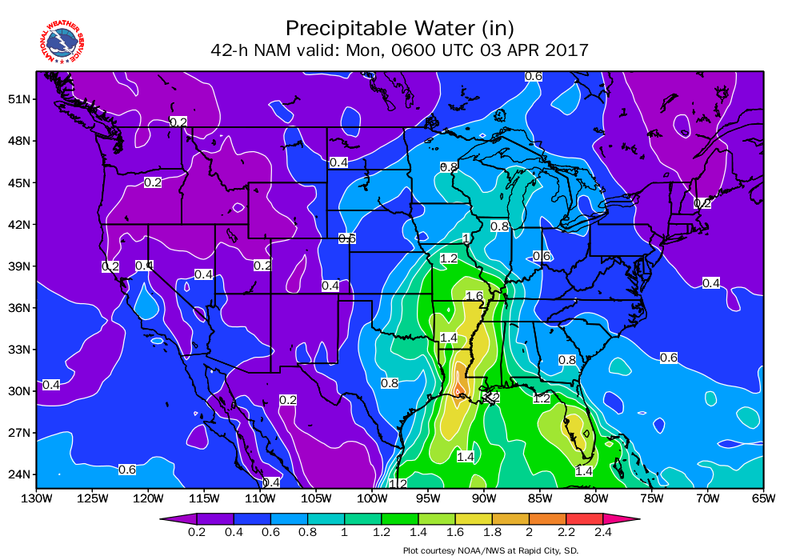 A combination of moisture, lift and strong low-level wind fields will create an environment favorable for heavy rain and tornadoes. A cold front will sweep through the region by Monday afternoon, ending the risk from west to east. After 1.5 – 4.5 inches of rain fell across Southeast Louisiana and Southwest Mississippi on Thursday, the ground is saturated and rivers will rise as runoff continues this weekend. As the next storm system approaches, moisture in the atmosphere is forecast to increase to record levels, more than double the normal level for this time of year. As a result, very efficient rainfall processes will occur. For expected rainfall, the National Weather Service (NWS) says, “ three to six inches with locally higher amounts possible." Those amounts are roughly over about a 12 hour period and a FLASH FLOOD WATCH in in effect until Monday afternoon.” The NWS Weather Prediction Center (WPC) has issued a “slight risk” for excessive rainfall Sunday into Monday meaning there is a 5-10 percent chance of flash flooding. Additionally, runoff from this event could cause minor to moderate flooding along the Amite, Comite, Tangipahoa, Tchefuncte and Tickfaw Rivers. For an interactive river levels map, CLICK HERE. Recent model trends indicate that we could be seeing less rainfall as the system may speed through the area, with the heaviest falling closer toward Lafayette and Vermilion Bay. We'll continue to monitor as the flood threat develops. For the third time in 8 days, the risk of severe weather is also on the table. Once again, instability is expected to be high enough to support severe thunderstorms. However, unlike the previous two events (Saturday and Thursday), the surface low pressure system is expected to take a track much closer to the local area which increases low-level wind shear and therefore the ability for thunderstorms to rotate. At least through Sunday evening, at which point shear and instability will begin to decrease, there is some risk for tornadoes as well. The NWS Storm Prediction Center has included a majority of the WBRZ forecast area in an "enhanced" risk, or level "3 of 5" for severe weather. It looks as if the later we see this system move through the area, the better chance we have of seeing any potential severity wind down before it reaches us. At this moment, it is starting to look like that may be a possibility. Expect the worst of this system to be toward our west, yet be vigilant as we head into Sunday night. This is only an outlook given the latest information. Changes and updates can be expected through the weekend. Keep in mind, minor flooding is common along these rivers, sometimes several times each year. Catch the 10pm forecast tonight for the latest updates on the potential for Sunday night's event.